I know that Jennifer Cruise is a must-read author in contemporary romance, but I can’t decide which book to read first! Personally I’d recommend starting with Agnes and the Hitman, Welcome to Temptation, or Bet Me…anybody have a different suggestion? Oh, I’ve been really curious about this one! Please enter me in the giveaway if it’s international (but I’ll understand if it isn’t). And I’d definitely recommend BET ME as a first Crusie novel! It’s so much fun, it’s even won over lots of men I know who don’t normally read romance novels (as well as everyone I know who DOES normally love them). the premise of the story seems unusually, atypical and interesting! I don’t frequent these types of novels often, but this sounds promising. Bet Me or Welcome to Temptation are ones I usually recommend as places to start reading Jennifer Crusie. But now I feel the need to go reread Agnes! Hi Rose, wowww i love the premise of this novel, an amusement park which is also a demon prison. This must be very interesting. Look forward to read this one! I have yet to read a book by Jennifer so would welcome the chance. It sounds like an interesting concept for a book. What a coincidence, I just finished Maybe This Time by Jennifer Crusie last night. It too was different from her other books. No real romance and it was about a woman finding herself while caring for two orphans living in a haunted house. Wasn’t really a horror, paranormal or mystery, but general fiction with a touch of all three. I finished it in one day so I enjoyed it, but it was not what I expected. I have not read one of Jennifer’s book in a bit. Looking forward to it. Hope I win. I haven’t read one of Jennifer’s books yet but hope to read it soon. It sounds different from anything I’ve ever read. I like interesting books, too. Thanks for your drawing. I love Jennifer Crusie’s books. WELCOME TO TEMPTATION is a must read! DON’T LOOK DOWN by Jennifer and Bob is also very good. 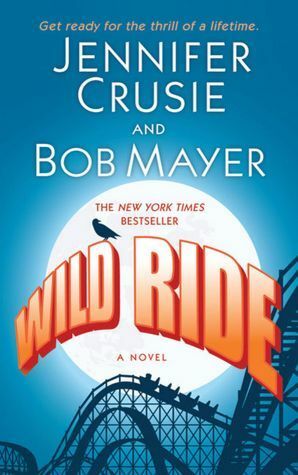 I’d love to read WILD RIDE. Thanks. What a great idea for a book! I have never read anything by this author but now I am putting her on my list for my next trip to the library. Such a sad, but very true line. Next Next post: Never shake thy gory locks at me!